US officials say Trump will ask Kim to give up all of the North’s nuclear weapons at upcoming summit. 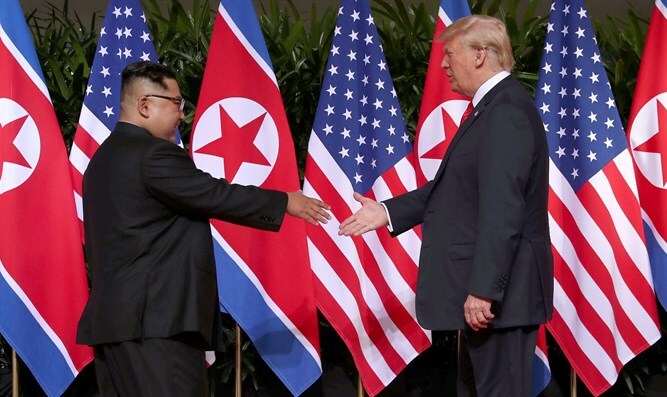 The United States and North Korea will seek a common understanding of what denuclearization means during President Donald Trump’s summit with Kim Jong Un in Vietnam next week, US officials said Thursday, according to Reuters. Trump is expected to ask Kim to give up all of the North’s nuclear weapons, added the officials. Trump and Kim will meet in Vietnam on February 27 and 28 for their second summit in an effort to thaw relations between the countries and reduce one of the world’s biggest nuclear threats. The officials said Thursday the United States remained focused on getting the North Korean leader to denuclearize, even if he had not made that decision himself so far. “I don’t know if North Korea has made the choice yet to denuclearize, but the reason why we’re engaged in this is because we believe there is a possibility,” one official said, according to Reuters. The two sides have not agreed previously on what denuclearization means. “It is ultimately about the denuclearization of North Korea. That was what was agreed between the two sides and that is the overriding goal that President Trump is seeking to achieve with this summit. This is an important step towards that ultimate goal,” the official said. He said the United States would press for a freeze on all weapons of mass destruction and missile programs and a “roadmap” to set expectations for negotiations. The two sides are not discussing the removal of US troops from South Korea, however, according to Reuters. The United States keeps some 28,500 troops in South Korea. The officials noted that punishing US sanctions would remain in place to give North Korea an incentive to move.